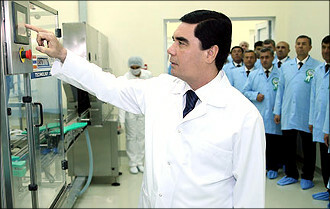 For more than ten years, a certified doctor, a doctor of medical sciences, a "social hygiene and the organisation of health care" professor has been the President of Turkmenistan. The former Minister of Health should have known all issues of public medicine better. However, health care performance in Turkmenistan is not efficient. Fergana observer Atajan Nepesov testifies. At present, there are dozens of newly built or completely renovated old medical centres in Turkmenistan equipped, as the country's main newspapers write, with state-of-the-art medical diagnostic equipment from the world's leading manufacturers, both in the capital and in the regions. Why, having all this, the population travels to other countries to get medical help from foreign specialists? As the well-known to me officer of the Gaudan-Bajigiran checkpoint told me at the border with Iran, people "leave in 'bundles'." "There are so many of them [patients], that we have a command to 'not let go!' came from the centre to our checkpoint, if we find documents and certificates in the personal things or luggage when crossing the border between Turkmenistan and Iran related to [patient's] health," customs officer reports. "But our people, you know, bypass even the most formidable obstacles. The ban on leaving Turkmenistan for survey abroad did not embarrass anyone, the people quickly came to their senses and found a way out of the situation. The patients now proceed as follows: they send all their medical tests, X-ray and ultrasound images, the conclusions of the Turkmen doctors directly to the Iranian clinic via the Internet or by fax, and they travel light and cross the border calmly." The Turkmen are going for a qualified, in comparison with Turkmenistan, medical assistance, not only to Iran. Direct flights from Ashgabat to Delhi and Amritsar, available flights plus a minimum of red tape when obtaining an Indian visa at the embassy of this country in Ashgabat make this direction for patients from Turkmenistan more attractive than even Iran. Also, the news about the high qualifications and authority of Indian doctors reached Turkmenistan now. In general, medical tourism, common in Europe, the US, Canada and other countries and continents, is gradually conquering the post-Soviet space, and Turkmenistan is no exception. But if the Americans and Canadians go for medical aid to Thailand or India to cut expenses, then our people are forced to discover foreign medicine for other reasons. It is by no means cheap for the Turkmen people to receive treatment in Iran or India. Extremely low qualification of their specialists, numerous fatal mistakes in the diagnosis and the prescribed treatment incapacitates patients for life. In this regard, the story of a resident of Dashoguz Zuleiha Bayryeva is revealing. The woman rushed to Iran after the local hospital doctor failed to diagnose her arthritis and scheduled an operation for a rupture of the tendon. It happened back in 2009, after which, two years later, another doctor summoned from the capital, underwent a new operation, already about chronic osteomyelitis of the foot bone, which further aggravated the already difficult situation. The Iranian experts after the examination came to the disappointing conclusion that neither one nor the other operation needed to be carried out, and they established an accurate diagnosis - arthritis. To date, Bayryeva moves using crutches and demands to punish the doctors and pay her compensation for both material and moral damage sustained. Every authority - from the prosecutor's office to the Ministry of Health - defends the doctors. Despite the difficulties with the movement, a woman had to travel to Iran three times already and this, she believes, is far from over. It is the Iranian experts who do everything to ensure that the condition of Zuleiha's foot does not deteriorate entirely. We note that almost all citizens who go abroad for treatment, apply for a visa through the state "TurkmenSyahyat" tourist enterprise. That is why their statistical data reports only about tourists. In the past few months, passenger traffic has increased to Istanbul and Ankara, and there are a lot of people among travellers who move only assisted. Many associate it with the closure of the Central Hospital in Ashgabat in April 2017, the only Turkish clinic the Turkmen trusted in and where they could receive qualified medical assistance. A doctor at an Ashgabat surgery says that the Turks and Azerbaijanis who worked here made a lot of money, which naturally could hurt Gurbanguly Berdimuhamedov. Firstly, as the president, because the money went to the pocket of the Turkish clinic owners, and not to the scanty budget the state. Secondly, as the dentist - it is unpleasant if the people do not appreciate the hospitals you built and do not trust your colleagues - graduates of the Turkmen State Medical University. "It even offends me that our patients are going for treatment abroad, and he [the president] probably is more insulted," says a female doctor. According to her, every year Turkish specialists in Ashgabat diagnosed and successfully treated thousands of our fellow citizens, naturally having money and opportunities. The Turkish hospital in Ashgabat, opened in 1999, was indeed very popular. People travelled from all regions of the country for examination. Wealthy people or, as they are called here, having "bash shaiy" - "five pennies", at the first symptoms of the disease turned to the doctors of the Turkish hospital. They preferred to give birth here, treat their teeth, undergo a complete examination. People of average prosperity, sometimes getting into big debts, also preferred Turkish doctors sitting in the sparkling clinics of Ashgabat. Now the hospital is closed, and its potential patients have lost the only opportunity to receive highly qualified medical care within their country. And from now on they are forced to go abroad for this help - to Turkey, Iran, India, on a smaller scale to Uzbekistan and Russia. There were no official reasons for the closure of the Turkish hospital in Ashgabat reported. But more than enough rumors and guesses - from the non-extension of licenses by the Ministry of Health of Turkmenistan and the desire of the authorities to force the people to use only the services of local doctors and clinics to the intrigues of the president's insatiable nephews and sisters, who, according to experts in the capital, unsuccessfully tried to pick up another tidbit of profitable business. Whatever it was, but now those who can go abroad to for treatment, and those who cannot turn, as in the good old days, to folk healers-tabibs, spellcasting sorcerers, fortune-tellers. People are trying their best not to turn to ordinary hospitals and Turkmen doctors knowing that there will not be much use for this, but they will drain money out repealing any patient. The specialist with 20 years of experience in the Ministry of Health and Medical Industry of Turkmenistan could not answer the question about the most prevalent diseases in Turkmenistan. According to him, they maintain the statistics, of course, all regions are obliged to submit reports to the Ministry of Health regularly, but summary data for the whole country is strictly classified. "I can say for sure," the ministry official emphasised, "that the picture of the incidence varies in every velayat (region). Advanced forms of hepatitis claim the first place in recent years, in the Mary velayat, for example. I am not able to voice figures, but it is a fact that every tenth adult has a history of hepatitis type B or C. The trouble is that the symptoms with these forms do not develop immediately, but the patient is considered contagious and can transmit the infection to another person during intimacy, as well as using non-sterile tools and syringes during blood transfusions or visits to the dental office." Local publications, including medical periodicals, do not report cases of the disease of the population with dangerous forms of hepatitis. It is not something to write about, but doctors are forbidden to discuss it, so as not to spoil the picture of flourishing health care under President Berdymukhamedov and the general prosperity and happiness his rule achieved. Only occasionally foreign publications and social networks announce fundraising for treatment of patients from Turkmenistan. For example, the story of the 11-year-old boy from Mary Evgeny Abdyev, who suffers hepatitis B+D and sustained an operation transplanting liver in India, the "Alternative News of Turkmenistan" edition wrote in July this year. A year or two ago, social networks raised funds for the treatment of a girl with leukaemia from Balkanabad, but they did not have time to help - the child died. "Our father Bairam, it turns out, had been sick for a long time, but in Mary, where we lived and where he worked successfully in the construction industry, nobody diagnosed him with the latent form of the disease, it could be identified already here in Russia, and then accidentally: his blood before a trivial procedure was checked and revealed hepatitis C.
He had been treated for a long time, and a year ago he died. By the way, my aunt with her son moved here to Russia. So, [doctors] revealed hepatitis C of a 13-year-old boy, brought from Turkmenistan, he had been infected in a new building of the dental centre in Ashgabat, where his tooth had been removed and where the current president, Berdymukhamedov, was the director. The boy is in the hospital all the time, has a serious condition". If the hepatitis type B, C plus D is rampant in the Mary velayat, then a bouquet of such diseases dominate a Dashoguz velayat, ecologically unfavourable because of the proximity of the Aral Sea. Talk to local cardiologists - they will say that cardiovascular diseases keep leading. In their opinion, there are no longer practically healthy people, who have normal blood pressure, but the number of individuals who have had a heart attack or stroke exceeds the limit. However, local oncologists will disagree with the conclusions of their colleagues and will give their weighty arguments in favour of cancer, which, in their opinion, is in the first place in the northern velayat of the country. Especially often, young women get breast cancer, and the mortality among them is also very high. Endocrinologists will give you their evidence that the level of diabetes patients is also incredibly high, and dentists will report that 90 percent of the population, from preschoolers to elderly people, have problems with their teeth, but they are not treated by specialists because of fear of pain, high tariffs for the services of dentistry and fear of catching an infection. The trouble is also that, in addition to the official payment to the medical facility, every patient in any Dashoguz hospital must "thank" the attending physician in advance, and even the nurse, so that they show sensitivity and attention, do their work in good faith and on time. Have an operation prescribed under general anaesthesia - multiply the expenditure in two or even three times. "If you want to see hell, be a patient of our hospitals"
It is what exactly the Turkmenabad resident Kadyrbergen wrote in personal correspondence via the Internet. "You will die, nobody will approach you until you give money. Patients are solely engaged in self-medication, in the sense that they pay a bed in the ward, hospital meals, disinfection, dressings, syringes, medicines for the operation, staff services. Pleading, moaning, appeals to conscience do not work for Turkmen doctors, how money works on them. You will pay the required amount, and the operation will not be postponed "for later", you thank with bills - the attitude to you will change immediately, and attention will follow. Money turns hell in hospitals, although not in heaven, but in a more or less tolerable stay there." When I asked Kadyrbergen about the benefits to patients on a medical insurance policy, he, in general, a courteous person, used obscene vocabulary. If you translate his words into a common language, the insurance medicine in Turkmenistan, in his opinion, is the same fiction, deception, as well as modern medical centres that sparkle with white marble from the outside, but empty and useless inside. People can tell a lot about the Turkmen health care system in a state of coma. They retell horrors in wards and operating rooms only conversing with each other. Official propaganda tries to convince them of the opposite, that "the healthcare sector, thanks to Arkadag [president's title means ‘Protector’] and his tireless concern for people, made a qualitative breakthrough" and "further improvement of medical services for the population is possible only subject to innovative development of public health services, that is, on the basis of progressive developments and methods."